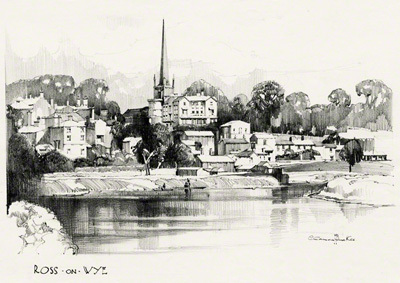 This pencil drawing has the same view point as the poster of Ross-on-Wye by Claude Buckle and is taken from where the new bridge spans the river. Ross is a very popular tourist center for the Wye valley. Ross-on-Wye was the birthplace of the British tourist industry. In 1745, the rector, Dr John Egerton, started taking friends on boat trips down the valley from his rectory at Ross. The Wye Valley's particular attraction was its river scenery, its precipitous landscapes, and its castles and abbeys. Created in 1935.